WASHINGTON – House Democrats on Wednesday introduced legislation to strengthen a decade-old equal pay law to ensure women are paid the same as men for the same jobs. The bill has the support of every Democrat in the House, according to party leaders. Although multiple laws have emerged over the past 50 years, hundreds of thousands of American women are still working every year for less money than their male counterparts in the same jobs, according to proponents of the equal pay bill. “It is the work that is performed, it is the content of character, the content of performance that ought to be the criteria – not gender,” he said at a Capitol Hill press conference. Hoyer said he represented his three daughters, three granddaughters and two great granddaughters, along with every woman in his Maryland district. More than a dozen speakers at the press conference, including House Speaker Nancy Pelosi, D-California and Reps. Alexandria Ocasio-Cortez, D-New York and Barbara Lee, D-California, all saluted the work of their predecessors in the fight for equal pay and emphasized that now is a critical time to secure more progress for the cause. The new bill, proposed 10 years after the Lilly Ledbetter Fair Pay Act signed by President Barack Obama, is designed to “close more loopholes in the original 1963 equal pay act” and to give women a wider variety of options and better tools to use against employers who discriminate, according to Hoyer’s office. House Democrats are taking advantage of a moment of historical significance: the bill will soon be on the floor of a House with more women members than at any time in U.S. history. 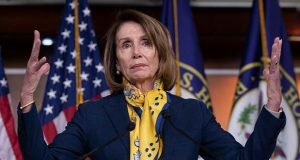 Pelosi said she wants to send the measure to President Donald Trump’s desk by April 2, which is Equal Pay Day. But the legislation’s prospects in the Republican-controlled Senate are uncertain. One loophole the bill seeks to address is the ability of employers to discriminate against female workers based on past wage histories, according to Ocasio-Cortez. The New York congresswoman also said the bill will encourage coworkers to share their salaries, thus enforcing equal pay at the micro level by making it legal to do so. “For all of those who say the wage gap does not exist, or that it’s a myth, then they should have no problem proving that,” she said. Democratic women senators, including Elizabeth Warren of Massachusetts, Debbie Stabenow of Michigan, Patty Murray of Washington and Jeanne Shaheen of New Hampshire, said they supported the new bill. Republican senators have not yet weighed in on the bill, but a similar measure was rejected by the GOP-run Senate in 2014. Ocasio-Cortez said the Democrats’ proposal sends a “powerful message to this country” that not just women, but all gender identities matter.